(Phys.org)—NASA's Mars Curiosity rover has measured a tenfold spike in methane, an organic chemical, in the atmosphere around it and detected other organic molecules in a rock-powder sample collected by the robotic laboratory's drill. "This temporary increase in methane—sharply up and then back down—tells us there must be some relatively localized source," said Sushil Atreya of the University of Michigan, Ann Arbor, and Curiosity rover science team. "There are many possible sources, biological or non-biological, such as interaction of water and rock." 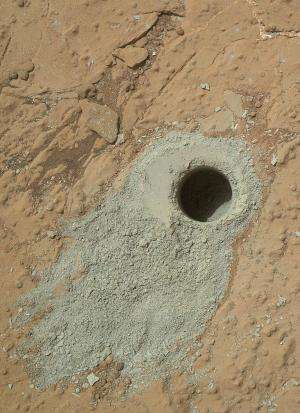 "It's really interesting that our measurements from Curiosity of gases extracted from ancient rocks can tell us about loss of water from Mars," said Paul Mahaffy, SAM principal investigator of NASA's Goddard Space Flight Center in Greenbelt, Maryland, and lead author of a report published online this week by the journal Science. 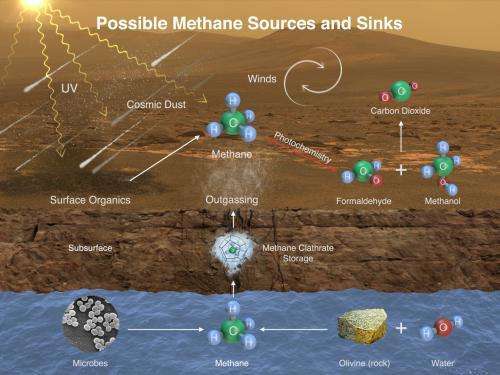 I like how the possibility of methane originating from life beneath the surface, in the form of the anaerobic methanogens, has not been ruled out. If that is the case, we might find hydrocarbon deposits beneath the surface, like oil. The digestion of ferrite substrata by these archaea yields oil as one the processes by which this valuable resource is sourced. The potential ramifications are enormous. the question is ... Who farted? It's ghouls I tell ya, religious ghouls. looking for a place to call their own. The more suggestive the evidence becomes that mars might harbor life the more concerned we should be about contamination, particularly if we're serious about getting there ourselves someday. We ought to do everything possible to tease out its secrets before sneezing all over it. Is there a sample-return mission already funded and in the works? If not, there ought to be. Hydrocarbons are found throughout the solar system which are not produced by organisms. We should expect to find them on mars as well. We should expect to discover that at least some of the hydrocarbons found here on earth are abiogenic in origin. You future Mars explorers, take your bio hazard gear. The life you safe may be your OWN!! Listening to skeptics on the possibilities of native Martian life, however it got there can put you at risk, so protect yourself. Better to be safe than sorry. Phys.org as usual relies on laymen's confusion about what "organic chemical" means. Carbon is the 4th most abundant element in the Universe. (after H, He, and O) It would be astounding if methane (composed of C and H; CH4) was not present on Mars. We've known for decades that the Gas Giants have megatons of 'organic chemicals', and yet why don't we hear chatter about whether we've discovered 'traces of life' there? Simple: this spin is about funding, not science. In fact the abstract cited says that the average methane detected is LESS than what we expected due simply to the reactions of meteoric debris on its surface. This drum-beat for Mars missions is similar to the Shuttle program. A lot of pseudo-science and misdirection, little science, and that only used selectively. What I'd like to know is how deep would life have to be buried for it to be present under, say 1% or 0.01% of the surface? That is: we expect that life will emit telltale organics into the atmosphere (waste products). How deep and how geographically limited would we expect these active areas to be in order to be consistent with the (virtually zero) concentrations we're finding? Obviously, this question would rely on deserts on Earth for a baseline. My cynical guess is that we're not hearing answers to this type of question because it would threaten funding for future studies. IOW its not in the financial interest of either the space agencies or the space scientists to tell us. That sounds like something basic and elementary that would have occurred to scientists, don't you think? Why don't you look around on the INTERNET and see what you can find? Me: TopCat22 did you fart? sselig: I love playing darts. @TheGhostofOtto1923 On the one hand, we had Carl Sagan describe Saturn's moon Titan as having the conditions of a pre-biotic Earth. On the other, we know now that over 90% of the methane found here was/is produced by archaea. Regardless of how the methane got in Mars, it is tempting to think that someday we might be prospecting for oil there. THAT is what is known as a theory. Similar such theories said that mars and the moon were dry. We find abiogenic hydrocarbons all over. What do you suppose happened to earths share? Maybe the archaea ate it. Incidentially, they found chlorobenzene and dichloro- -ethane, -propane and -butane, thought to be the thermal decomposition of other organics with the pervasive perchlorite (bleach) present in the soils. Arguing that methane is a 'building block' of life is like arguing hydrogen is. Both are so common in the Universe their presence is not evidence of much of anything. As I said previously, the methane is lower than expected based on the models of (meteoric) dust present on the surface. I wonder if this dust is the source of the chlororganics, too? If a trace amount of Terrestrial microbes could inoculate an entire planet in 40 years, it would mean that Mars was extraordinarily fertile. Which would mean that it would probably have its own life already. I see elsewhere from a good source (John Timmer @ Ars) that impact generated methane has been ruled out for the atmosphere findings. [And then is less likely for the ~ 4 billion year old Cumberland organics, if those are derived from rock inclusions.] But I haven't had time to read the papers. CH4 for methanophiles is, together with CO2 and the hydrogen rich waters found in crusts for acetogenes, the root metabolisms on Earth and in the most likely life emergence pathway (alkaline hydrothermal "engine" pathway). Possibly from there methanogenes can evolve but it is the hardest step and demands efficient metallo-protein enzymes. @Z99: The baseline is what would be expected from impactors. The seen spikes (and their similar earlier remote observations) apparently are too massive. Specifically, they could exclude a nearby impactor for these spikes. The depth where organics survive radiation over 100's of thousands of years, and so can be a food source, have been reported long since out of Curiosity. IIRC that zone starts a few m down. (0.5 m of rock protects organics for 0.5 million years, but Mars is geologically sluggish.) Of course you would expect life to be around the ground ice and perhaps water, so likely 100-600 m down. Re methane, see my earlier comment: It, and CO2/H4 for more organic fixation and energy release in the presence of electron acceptors such as volcanic derived NO2, is the root metabolism here and presumably elsewhere. That, together with finding organics at all, is prerequisites for habitability as we know it. z99 and tbjorn ask good questions. My theory is our sun is a dying magnetar and cyclically emits from the equator stronger and perhaps unidentified energy that heats the core of planets. This heating provokes the release now identified on Mars, what little remains to be released. Perhaps this energy release is reinforced by planetary alignments. Perhaps we will fall under Jupiter's influence as Sol's wanes. I suspect Earth endured enormous energy washes from Sol and 600,000,000 y a weakened sufficiently to allow life to begin and endure periodic setbacks. Remember comb jellies began BEFORE sponges. Well, now. That's what we call being facetious. You're just being argumentative, not at all a desirable personality trait. Methanogens digest the iron in the crust and turns it into its waste products, an ongoing process which technically makes the hydrocarbon source replenishable, but we are just using it up too fast. The theory" if you will, is that this same process is going on inside Mars, and why do you dispute this?